Satellite Testing Vacuum Systems engineered and built for the satellite industry. Chambers are He leak tested to a rate of 10e-7 cc/sec or better as required by the end user needs and are designed to maintain this level for extended robust use dependent on seal condition and customer practice. To get an accurate quote for the system you need fill out our RFQ or call today! 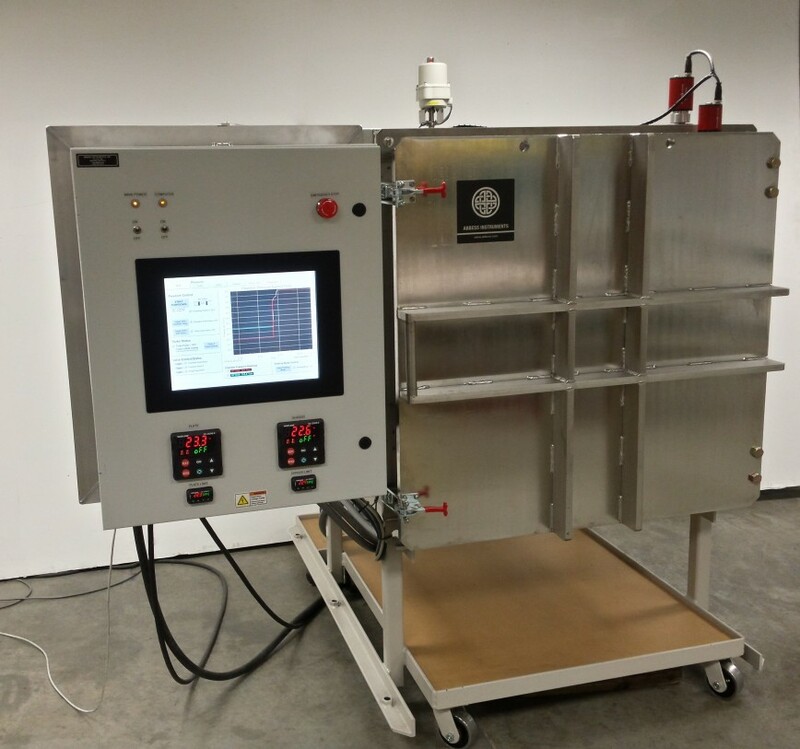 Vacuum Chamber (as shown above) – A Front Loading 36” x 36” x 36” Stainless Steel Chamber with a right hinged Stainless Steel door. The interior of the chamber is Electropolished to attain high vacuum. Thermal Platen System – AeroGlaze® Coated Aluminum Thermal Plate with resistance cartridge heating elements and refrigeration media piping engaged in the under the surface of the thermal test platen. Thermal Shroud System – 5 sided AeroGlaze® coated Aluminum thermal plate with resistance cartridge heating elements and refrigeration media piping engaged in the surface of each side of the shroud. Thermocouple monitoring and temperature control via PID controller. Electromechanical Foreline Valve – Segregates the chamber and Turbo from the Roughing pump when venting the Chamber. Electromechanical Chamber Vent Valve – Gross venting valve. Electromechanical Chamber Purge Gas Vent Valve – Connected to the gas purge kit to allow dry nitrogen purge into the chamber. Gas Purge Kit – A set of preconfigured regulators, pressure relief valve, and gauges provided a controlled gas into the chamber. Front View of Thermal Vacuum Chamber for satellite testing. Chamber and thermal shroud door open. The black interior simulates the light absorption of outer space. Top: Detail View underside of Thermal Platen. Bottom: Detail View underside of Thermal Platen. Detailed side view of thermal vacuum chamber containing thermal shroud.